It is with great delight that my working life is returning to some resemblence of routine this morning after working for a month around walks, cycling, trampoline bouncing, movies, games of Monopoly and SkipBo and cleaning up after marathon pikelet, pancake and muffin-making adventures. Both my two are in new classrooms with new teachers this year (after two years of the same) so I’m waiting with baited breath for the end of the day to see how it all went. They were asked this morning what they loved most about the holidays. Sarah went horseriding in Gisborne while staying with Grandma and judging by the request for more jobs for money for her horse fund, I don’t think we’re going to get out of that one too easily. Lachlan loved long cycles with his dad, going to the Amazing Maize Maze in Hastings, playing soccer on the front lawn with his cousins from the South Island and seeing kiwi and eels at the Mt Bruce wildlife centre (having McDonalds for lunch that day also warranted a mention). My favourites included the weather holding out long enough for me to get my beloved long drawn out day at the beach in Gisborne (going after breakfast, swimming til 11ish, going home for lunch to escape the heat of the day and going back at 3ish til the lifeguards knock off at tea time). Beating that this year though was the visit of one of my sisters and her family from Dunedin. While they didn’t get treated to the blazing summer sunshine that Hawke’s Bay is usually blessed with at this time of year, it didn’t stop the fun. A thunderstorm put paid to the game of cricket on the front lawn, but the soccer the night before was only interrupted by the man of the house putting a BBQ roast lamb on the table. We did do a bit of reminiscing though, as you can probably imagine, including summer activities on The Glen in West Otago where we grew up. We used to “stook” the hay into three high (the Boyds next door used to stack four high – bugger that!) Five in a row on their sides, four flat on top then another four on top again. Mum used to drive the rake that swept the hay into rows and Dad was always on the baler. 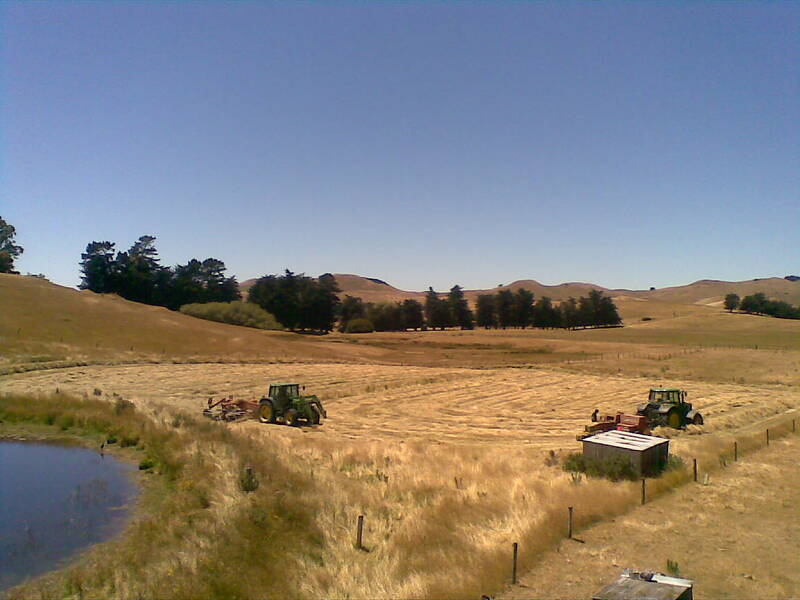 As I was picking up our bales one by one and putting them on the trailer behind my car to take to the shed (we own a lifestyle block remember – Dad’s hay paddocks would be bigger than our whole property!) I remembered our baler at The Glen had a sled behind it that collected the bales until there was enough for a stook and then Dad would pull a rope and release them. We used to ride around on the back of that when we could. Don’t tell OSH. Dad would then pick up the stooks with clamps on the front of the tractor to take them to the stack or hayshed, where, if we were lucky, members of the local fire brigade would be ready to help. Picking up 150 bales wasn’t nearly as strenuous. Most of my summer holidays at Kinloch on Lake Wakatipu (past Queenstown) or at home on the farm, which probably bored me senseless at the time, have formed fantastic memories. My kids conversations this morning go to prove that memories aren’t made of big wonderful adventures that cost lots of money – they’re made of the little things that capture our senses in one moment of time. gee sounds like sarah is really keen on the horse thing, you better send her my way and i will put off for life picking poos up in the paddock!!! Brought back memories to me too Kate! We always listen to you on Jamie’s show. I see Mum is as sharp as ever.You had better pay up! !